Our hand-curated collection of blazers and sportcoats is sourced for only the highest quality American and European brands, made from luxurious fabrics and with extreme attention to detail. Featuring globally renowned designers such as Canali, Coppley, Corneliani, Pal Zileri, Latorre and Robert Graham, we pride ourselves on bringing the sort of selection you’d typically only find in the world’s preeminent fashion cities directly to the Greater Cincinnati area. Blazers and sportcoats are striking and versatile wardrobe staples that can upgrade almost any look. For more formal settings, we recommend pairing our sportcoats with a tailored chino and button-down. For something sleek and casual, pair with slim-fitting jeans and a tee shirt. An exceptional selection and perfect combination of your sport coat with ensemble accessories not only give you that professional look but also makes the trend of your outfit the center of focus when you step out there. It’s our great pleasure at Hellman Clothiers, to take you through the journey that will enhance your elegance in sports coats. Let’s start from the beginning. What is a Sport Coat? To begin with, it’s very imperative to differentiate between a sport coat and other varieties of men’s jackets that you may find in the market. The first sports jacket was a trademark of luxury and was worn purposely for games like shooting, horseback riding, etc. Over the years, the fashion flair and purpose began to change and being replaced with classic styles of sports coat. Furthermore, the sports jacket is more shapeless and looser than the typical blazers and suit jackets; although a more substantial fabric is mostly used. The main features of this design are elbow patches, and a slit and pleats in the back, though these may not appear on every style but are impartially common. Unlike sports jacket, the modern sport coats are creatively designed in a vast range of colors, single or double-breasted design, exclusive decorations and sturdier fabrics including tweed, windowpane, linen, houndstooth, cashmere, and flannel, to mention a few. Also, the length of the coat- from mid to lower crotch- in contrary to the traditional jacket that customarily reaches the knee and a softer construction that promptly makes more resourceful than other jackets. This is typically worn in sporting activities like riding, shooting, hunting, to name a few, but it also looks classier when casually dressed with best shoe selections like brogues. This sport coat is made of textured fabric fabrics like corduroy or tweed with optimum quality. It was initially fashioned for an outdoor event with a premium functionality which makes it super convenient to dress up or down. They are most appropriate for winter/fall season. So, as the winter draws closer, you’re warmer with tweed sports coat! The most casual sport coat so far. These are sport coats with super soft shoulders, minimal lining, and always made with twilled cotton that looks stylish with a few rumbles and wrinkle produced to it. They look more adorn when paired with Button down shirts and cruised with jeans., and can exquisitely wear with classic style sneakers. Just like the earlier mentioned tweed sport coat, it indeed expresses some degrees of formality. These are periodic sport coats and can make you feel great even in the hottest temperatures (summer). Next time you’re out there for shopping, look for a content type with minimal lining since the full lined kind always unpleasantly counter-productive when it comes to an ultimately breathable textile material like linen. 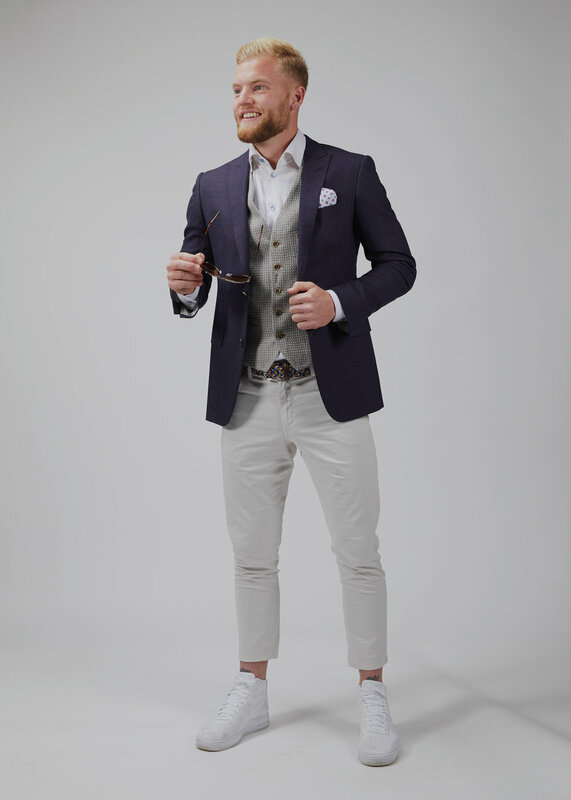 The linen sport coats are quite easy to dress up or down like tweed and are frequently end up more like a casual due to the fabric used to make them. This is a sport coat that can be substituted for a more traditional, dressy wool blazer or suit. They are more structured than the initial rumpled-casual fabric options. Polished cotton coat usually has a smooth cotton fabric, though contains less texture compared to the tweed fabric. When Do You Wear a Sport Coat? A handsome look that ladies appreciate isn’t just only about grooming but stepping out with an impeccable style on your first date. The sports coat provides you with plenty of pockets to hold necessary items to make your first date lovey-dovey, and it helps you to offer your gal coverage when she gets cold. Plus, the coat exaggerates the healthiness of your masculine traits as you look smart and sharp without out-dressing your date. If an office or job dress code is casual ansd relaxed, you’re allowed to wear sports coats in a creative manner such that you may combine it with khakis or any other smart slacks in an acceptable way for the interview. The combination of functional, durable and put-together sport coat and khaki will not only allow you to move conveniently, however with confidence. Also, any work that the workplace straddles between field and office, that is if your job is where you sometimes be in office and sometimes outside on the field at a construction site, aim for contrasting but coordinating colors of your coat with a t-shirt and nice denim. You can make your next traveling or tour long-lasting memory by opting for a quality built and comfortable fit coats, most importantly when you’re heading to a cold or wet place. Some of the best options for a stylish traveler is the classic sports coat that is lightly lined and water resistant. The choice for a sports coat, perhaps lighter and handy when traveling always contributes to an intriguing experience. On this notes I will say any choice made, ensure a coat with a minimal pattern, not made with attention grabbing the color and that fits well should be carefully chosen. How Do You Style a Sport Coat (Formal or Casual)? One of the beautiful things about sport coats is that they can be styled with any form of pants and nicely designed shirt. That is, you don’t have to force yourself into any pair of tight suit trousers, but you can sit comfortably into your favorite and lovely pair of khaki or chinos for official reasons, perhaps jeans to make it more casual. Gratefully, wearing sport coats is mostly complemented with personal preference of any accessories you want to style with it, though there are few guidelines as explained below, however, needed to be considered. This is a critical area where you’ll need to apply optimum discretion. The first question that’s often asked is that for what purpose you want to use the sport coat. As mentioned earlier, it may range from traditional applications, like sporting activities, official or casual outings. More importantly, it’s imperative to know if the coat will be of sports variety, or type you can pair jeans with the sport coat. This is usually a smarter casual outlook where you must have your jeans spiffier. So, to create a sleek silhouette, you need to stick to regular or slim fit jeans. More so, choose jeans that are darker in color than your coat; dark denim isn’t only somewhat more exclusive, but it’s pretty nice for hiding stains. Always avoid rips, fraying and fading jeans for a more elegant look. Ultimately, any jeans that lean more towards the bespoke look will complement your coat best! As for the coat, you may want to opt for a more casual fabric such as linen. You can always play around with the pattern and colors of your choice, like browns or tan, perhaps you couldn’t wear in a formal gathering. Similarly, you can modify your light colored coat and dark colored jeans, and vice-versa for a stylish yet smart look; but you don’t have to match your shades as you might want with a blazer. Go for a casual oxford-collar button-down shirt (OCBDs). The crispy oxford looks good with a reasonably formal sport coat, but the chambray button-down or denim matches with a casual look. You can also opt for a striped and checked shirt to look shrewd. It’s not advisable to wear a t-shirt under a sport coat as its casual expression frequently clashes with the coat. When dressing up to look dapper in a sport coat, it's preferable to choose a brown pair of oxfords or brogues for the footwear. For a bit step down from that level, you may go for a double monk strap or loafers shoes. To look more casual, a pair of sneakers or dress/work boots may be perfect. A cowboy boot with denim and a sports coat is a superb outlook that exceeds all categories and works well some regions of the country. Adding tie may be an unnecessary addition to what is moderately casual look, but can be brought off if the link is more casual and heftier-textured and beefier wool, and consequently complements the rest of your costume. Pocket squares are now becoming trends in men’s fashion world, so it’s worthwhile to be available in your wardrobe. They are a lucrative addition if you want a colorful ensemble. Like a tie, choose a thick and rustic fabric rather than silk, however with a simple and silhouette fold than a bloated one. Yet, when uniting all these elements, ensure you adhere to a constant theme. That is, if you want to go for a dressy outlook, rock either your crisp oxford or brogues with the pocket square, while for a casual look, use the pocket square with leather or work boots and no tie. In some informal settings, wearing wrist watches may seem contemptuous because it’s been strongly associated with flamboyant acts, perhaps display of wealth. But I want to encourage you not to allow this type of mentality cripple you from combining a beautiful watch with a stylish suit. A fancy stainless steel timepiece looks chic when used with sport coats to an office or formal outings. Casual watches like sports watch are always easy to mix and match with colors depending on the occasion. Generally, watches with grey or blue face are the perfect piece for sport coats. Where Can I Find a Sport Coat? With these explanations, you might have been thinking of the best outlet to explore these opportunities. I want to congratulate you because all the old coats in your wardrobe will undoubtedly experience paradigm from this moment. So, for your next shopping trip, just stop in Hellman Clothiers in downtown Cincinnati. A sport coat is an invaluable investment to any man’s wardrobe. They’re ageless fashion style that appreciates both formal and casual settings. Their versatility made them extremely useful to navigate through situations or events. So, if you’re thinking of the best clothing for your next outings- dinner, conferences/meetings, field trips, to name a few, sport coats is the next confidant!